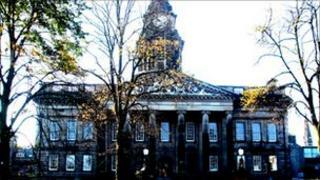 Labour and Green councillors have reached an agreement to run Lancaster City Council. The Labour Party gained 11 seats in the local elections but fell short of an overall majority and the council was left with no party in overall control. The party said it had entered a "joint administrative arrangement" with the Greens to run the council cabinet. Labour's Eileen Blamire will be the new council leader, taking over from Liberal Democrat Stuart Langhorn. The Green Party - which lost four seats in the election to drop to eight - said it was not a coalition and Green members will be free to vote as they wish in cabinet. The agreement was reached at a full council meeting in Morecambe on Monday.